Got a super villain problem? You won't after you slip into this Supergirl costume! 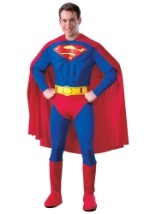 This superhero costume includes a t-shirt and cape. The blue Supergirl t-shirt is made of 100% cotton and features screen printed details to recreate her classic look, including Supergirl "S" symbol, muscle outline, and yellow belt over red pants. The red cape attaches to the back of the shoulders with Velcro. The cape also has the Supergirl symbol screenprinted on it. No villain will want to mess with you!